The stunning reality star confessed that after the stress and publicity of her televised wedding in August, she wants her next ceremony to be on an island far from prying eyes. Kim Kardashian’s wedding to basketball player Kris Humphries on August 11th was certainly a lavish affair, and at an estimated cost of $10 million, may have been one of the most expensive ceremonies in recent history. Few luxuries and expenses were spared, but according to Kim, there was a key ingredient missing –intimacy. Following in the footsteps of her sister Khloe, Kim opted to let the reality TV cameras and generous sponsors in on her special day. Televised on the E! Entertainment network and watched by more than 10 million people, every moment, the good and the bad, was captured for viewing by her fans. “When I saw Khloe and Lamar get married — and they had their wedding on TV — I thought, ‘Oh, my gosh, that’s so exciting! That’s what I want!’”, she said. Sadly, Kim’s marriage was not to last, ending in just 72 days, but her thoughts already seem to be turning to what her next wedding will look like. In an interview in the new March edition of Allure magazine, the reality star made an understandable confession – it’s time to make take her romantic life back from the spotlight. And what better place to do that than on a remote, exotic private island? Kim is no stranger to tropical island destinations, having travelled to spots like French Polynesia, Anguilla, and the Bahamas on holidays. Plus, when it comes to choosing a location for a private island wedding or honeymoon, there are plenty of other celebrity examples to follow. The Duke and Duchess of Cambridge recently brought widespread acclaim to the island resorts of the Seychelles when they honeymooned on North Island – it’s hard to get more secluded than this beautiful Indian Ocean nation. A little closer to home, David Copperfield’s Bahamian isle of Musha Cay is another celeb-beloved spot. 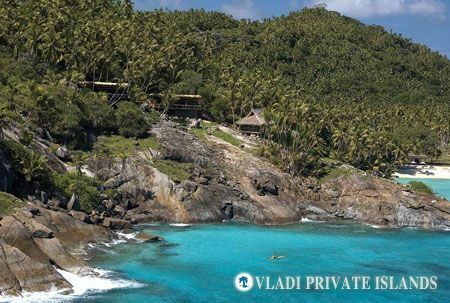 On the other side of the earth, famous faces like Britney Spears and Jessica Simpson picked Fiji’s Turtle Island for their post-nuptial celebrations. From Australia’s Great Barrier Reef isles to the sultry Caribbean, there is no shortage of amazing private islands for Kim to choose from for her next wedding. But to give her next romance a chance to blossom, she’ll have to leave the reality TV cameras at home.